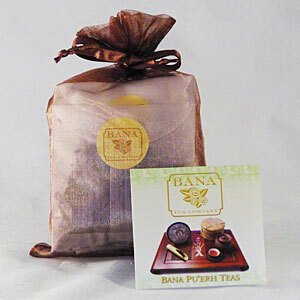 This is a great opportunity to try all of Bana Tea Company's premium ripe Pu-erh teas for a very low price. This collection comes in our gift-quality designed packaging of a sheer organza sack tied with a satin ribbon. Inside are 7 labeled samples of loose tea chipped off of our Pu-erh tea cakes and bricks. Also included is a mini brochure with descriptions of each tea in the sampler as well as brewing instructions for best results. This sampler makes a wonderful companion gift for a Gift Certificate or any of our brewing accessories, especially for the novice Pu-erh enthusiast. The sampler includes Red Sunset, Denong Wild, Simply Classic, Chen Xiang Aged Ripe, Ginseng Scent Ripe, Tang Xiang, and Tribute Ripe Brick. See individual tea descriptions below. Each tea sample weighs 8 grams for a total of 56 grams of tea (approx. 2 oz). Flavorful and rich, this tea is thick, smooth and has a clean texture that leaves a pleasant sweetness in your mouth and throat. Clean and warming, this tea possesses a woody and warm chestnut flavor. A perfect daily tea if you are a fan of ripe pu-erh. This mellow, smooth aged ripe Pu-erh is not only satisfying to the palate and soothing to the stomach, it is also calming to the soul. Drink it after a meal or whenever you feel overwhelmed. This ripe Pu-erh is thick, brothy, and savory. It finishes with a cooling sensation on your mouth that is similar to the aftertaste of Ginseng soup. This incredibly clean aged ripe Pu-erh offers a thick, yet very silky and smooth mouthfeel with a sweet finish. This tea offers a unique rice soup scent and a sporty finish which can usually be found only in well-aged Pu-erh teas. It leaves a clean, sweet throat-soothing sensation. Our responseHi Debra, Thank you for writing about your tea tasting group experience. It brings a smile to my face when I know you and your friends enjoyed the teas and the overall experience. I read the book The Tea Girl of Hummingbird Lane by Lisa See, which I loved. I have a friend for which I buy all kinds of tea and apparatus for birthday and Christmas. After reading the book, I wanted to buy the Pu-erh tea for her. I also like tea so I bought two of the samplers and I tried the tea along with my book club friends. It is wonderful tea and I was able to make several cups of tea from a small piece of the "tea cake". I'm glad the web link was in the book. Sheila, Decatur, Illinois. As a showcase of ripe puerh, there's a lot of variety for an excellent price, and the older teas are a nice treat (I particularly liked the Chen Xiang). The selections overall can't be faulted, but there's only enough of every tea for one series of infusions each. That leaves little room for error or experimentation, which, for something specifically targeting novices, seems a bit self-defeating. Our responseIf you still have any samples left, you can divide the leaves into 2 servings. Use half of the leaves (4g) and steep in 5 oz of water. Repeat steeping the leaves to make more tea. This way you can try the tea twice.